IN 2015-16, AFC Bournemouth and Stoke City will play each other – in the Premier League. In 1990, my pal Kevin and I visited Bournemouth v Stoke in the old third division. The game was fairly forgettable and notable for the fact that Alan Ball, hero of 1966, was manager of the Potters. As we made our way home, we picked up the train at Bournemouth and, as we chewed over an average sort of football experience, a tall chap, smartly dressed, joined us at the next station. He sat opposite us and mumbled, “Alright lads?”, and sat awkwardly, taking up most of the available room. “Been to the game?”. Innocently, we asked him the same. He was obviously interested in football. “Hang on, I recognise you. You’ve just played in the game,” I said. He grinned and acted out a near post header. “You’re Trevor Aylott,” I said and shook his hand. His grip was blokeish and firm. 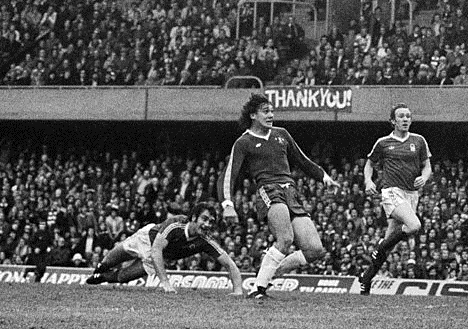 Aylott was a journeyman footballer in every sense of the word, but I have never forgotten his two goals for Chelsea in 1977-78 season. Introduced at a time when Chelsea were going through difficult times, he was young, raw but willing. Ken Shellito, trying to big up the powerful youngster said he “moves like Peter Osgood and is as brave as Ian Hutchinson”. That was some billing and he couldn’t possibly live up to it. Nevertheless, the young Aylott did make an immediate impact. He scored the 55th minute winner against Bristol City, Chelsea’s first goal in five games, with a “textbook header” from Charlie Cooke’s cross. How did he celebrate? : “I’m going out to a dance with my girlfriend,” he told the media. A week later, he did it again – in the same minute against Nottingham Forest. Kenny Swain played the ball through, Aylott brushed aside Larry Lloyd (no easy task) and shot past Peter Shilton. Chelsea won 1-0 – one of only three league defeats for eventual champions Forest. His Chelsea career peaked almost there and then, for we saw precious little of Aylott from thereon at Stamford Bridge. Strangely, Aylott’s reputation grew after he left Chelsea. He moved to Barnsley in 1979 and then onto Millwall, Luton, Crystal Palace, Bournemouth, Birmingham, Oxford United, Gillingham and Wycombe. For some years he had worn a headband. We had a good chat all the way back to London. “You fellows know your football,” he said, which we regarded as a great compliment. I caught up with him against in 1993 when he was playing for Bromley at Hitchin in the Isthmian League along with his old Chelsea mate, John Bumstead. “I still remember those two superb goals,” I replied. “Course you do. Up the Blues eh?”. He seemed a decent individual. I hope he’s faring well today. Was at both of those Chelsea games Neil. There was a flag hanging from the middle tier at the Bristol City game that said “please score”. At the Forest game another flag in the same place simply said “thank you”. I remember it well, Paul!